I've looked through quite a few big telescopes since I took up stargazing as a youngster back in the early 1970s. I once caught a glimpse of a gravitationally-lensed galaxy in a 30" reflector on a transparent autumn night. I nearly fell off a ladder at the incredible sight of the Veil Nebula through a 25" Dob in pristine sky at a summer star party in the Adirondacks. I even enjoyed a peek through the 100" Dupont telescope at Las Campanas Observatory in northern Chile when I was a graduate student in the late 1980s. But after all these years, and despite the availability of large and reasonably-priced Newtonians and compound reflectors, there's one type of telescope I turn to most often for visual observing: the small refractor. Why a small refractor? When it comes to telescopes, after all, physics tells us that bigger is better. A telescope with a larger aperture collects more light and therefore gives brighter star images. It enables higher resolution which lets you see sharper and finer detail, and which is especially important for observing the Moon and planets. And it gives you larger (if not brighter) images of extended objects such as galaxies and nebulae. But larger aperture means a bigger, heavier telescope and longer set-up and cool down time. It also involves the psychological inertia of setting up such an instrument. If you've ever tried to assemble an 18-inch Dobsonian on a cold and breezy winter night, the merits of a small refractor, one with an aperture of about 75-85mm, give or take, become clear in a hurry. First, there are the obvious advantages. A small refractor is lightweight, just five or ten pounds, ideal for grab-and-go observing on a simple alt-azimuth mount. It's also easy to use and requires no optical alignment. Just aim, focus, and enjoy. It's also versatile. You can look across the galaxy at the Pleiades or the Orion Nebula, or across the yard at a bluejay or family of robins feeding their young on a spring afternoon. Then there's the superb contrast that a refractor affords for visual observers, the so-called 'refractor experience', especially with instruments with a good ED or apochromatic objective lens. The star images are beautifully small and sharp, with classic diffraction rings enveloping each as if rendered in an undergraduate optics textbook. Shadows and darker features on the Moon appear finely etched against a bone-white background. Even brighter and larger deep-sky objects such as the Orion and Lagoon nebulae, especially in dark sky,snap into view with astonishing contrast with an appearance that's hard to equal in a larger telescope. "I came to cherish it as an instrument of deliverance, the keys to a kingdom vast, ancient, and spectacular. With it, I saw the sand-colored rings of Saturn, the blue-white stars of Orion, the golden glow of the Omega Centauri star cluster, and a thousand other things so big, so venerable, so hot or cold as to balloon one's sense of the plausible." Few may wish to return to a 3" Tasco Newtonian, or even to a more reputable 60mm or 75mm Unitron refractor. But with far superior small instruments now available, especially the fast ED and apochromatic refractors from Tele Vue Optics, William Optics, Takahaski, Astro-Physics, Explore Scientific, among many others, those of us who started out with a small telescope can return to enjoy the modest sights that first captured our imaginations when we began as stargazers a long time ago. Which brings me to perhaps the most important and least appreciated benefit of a small refractor: it imposes constraints. When you own a 15"-20" Dobsonian, the universe is yours. You have millions of objects to see, thousands of which will appear big, bright, and spectacular, and when planning an observing session, you are bedazzled by choice. With a small refractor, however, you must think a little harder. You need to select the right kind of objects to observe that will look good in a small instrument, or perhaps are even best observed in such an instrument. You're not going to be hopping galaxies in Coma Berenices or working your way down a list of obscure and dim planetary nebulae. But you are going to see hundreds of tight and colorful double stars, dozens of deep-red carbon stars, big and bright nebulae like Orion, the Lagoon and Trifid, the Veil, the Rosette, and many more. Big, colorful open star clusters like the Pleiades, the Double Cluster, and the Beehive look better in a 75mm-85mm refractor than in larger scopes. The Sagittarius Star Cloud, M24, is arguably the best target of all, and under very dark sky you can even spot the foreground dark nebulae B92 and B93 within this astonishing assembly of stars. On night of good seeing, planets are pretty enough in a small refractor. You'll enjoy good contrast,but resolution suffers, and most observers agree a bigger scope gives a better view. But the Moon is magnificent, and you can spend many pleasant evenings working your way through a good part of the Lunar 100, or just picking a crater near the terminator and watching the shadows slowly change as the Sun rises or sets. One of my most memorable recent views was with a Televue-85 cranked to up 200x, then to 400x with a barlow, and watching the Sun just catch the rim of the crater Copernicus then slowly fill the crater over the course of several hours. It might have looked better in a 14" Schmidt-Cass, but not by much. "...as we advance in life these things fall off one by one, and I suspect we are left with only Homer and Virgil, perhaps with only Homer alone." After a few decades of serious stargazing, I begin to feel the same way about telescopes and stargazing (and perhaps Homer as well). I turn more and more to the simplest of telescopes, with a superb objective lens, a quality star diagonal, a handful of premium eyepieces, a nebula filter, and some clear sky. A small refractor is an elegant tool that can show the universe in a timeless and humble way. 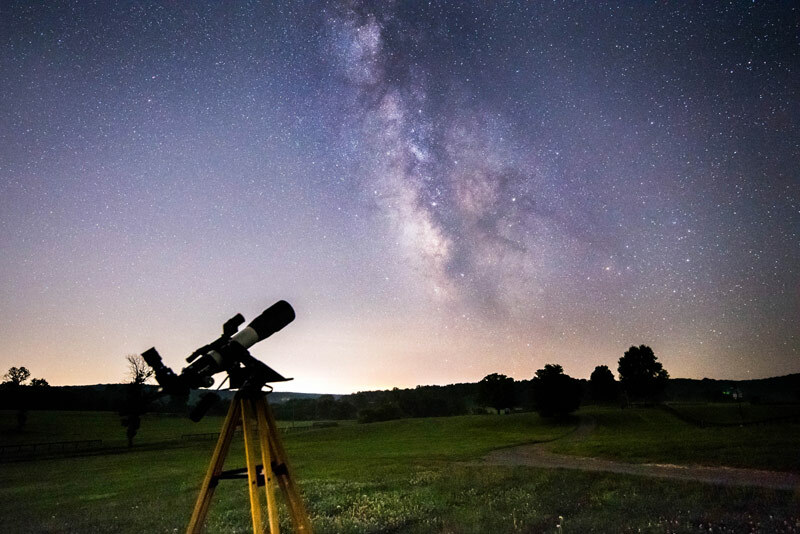 If you have a permanent observatory or the gumption and strength to regularly set up a big telescope, then enjoy the grandeur of the experience and please take the time to share the view with those around you! But if you're at a point where you feel a need for a simpler and timeless way to see the cosmos, then think small. charlesvane, Petrel, Dave In Vermont and 3 others like this.